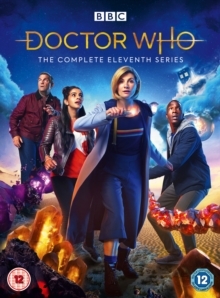 All ten episodes from the eleventh series of the relaunched sci-fi adventure drama starring Jodie Whittaker as the legendary Time Lord. After regenerating, the Doctor falls to Earth, unable to remember her name, and teams up with new companions Graham (Bradley Walsh), Ryan (Tosin Cole) and Yasmin (Mandip Gill) to go in search of her missing TARDIS. Caught up in her travels through time and space, the gang find themselves visiting Montgomery, Alabama in 1955, battling giant spiders and witnessing the partition of India.